Soil microorganisms are influenced by climate change. However, the effect of climate change on soil cultivable bacteria are unclear. In this study, the composition and diversity of the soil cultivable bacterial community were explored by a dilution–plate method, PCR, and 16S rRNA sequencing in a desert steppe of northern China after repeated NH4NO3 amendments and precipitation manipulation for seven years. The experimental treatments were as follows: control (CK), N addition (+N), N addition plus water addition (+N+W), and N addition plus water reduction (+N-W). Among the treatment groups, 11 genera and 17 bacterial species were isolated. Nitrogen addition and precipitation manipulation significantly increased the number of cultivable bacteria in the 0.00-0.30 m layer compared to CK. Compared to +N treatment, the +N+W and +N–W treatments had no significant impact on the number of cultivable bacteria. Compared to the CK community, bacterial communities exposed to the other three treatments did not show shifts in the relative abundance of dominant genera and other cultivable bacteria, except for Pontibacter and Staphylococcus. The treatments +N+W and +N-W significantly modified the relative abundance of Pontibacter and Staphylococcus compared to the +N treatment. Available potassium and phosphorus, and moisture content contributed to the change in the composition of the cultivable bacterial community (p>0.05). Nitrogen addition and precipitation manipulation significantly decreased species richness in the 0.00-0.02 m layer, but they did not affect evenness and the Shannon-Wiener Index in the 0.00-0.30 m layer. This study provides insights into how the composition and diversity of the bacterial community is affected by climate change scenarios. 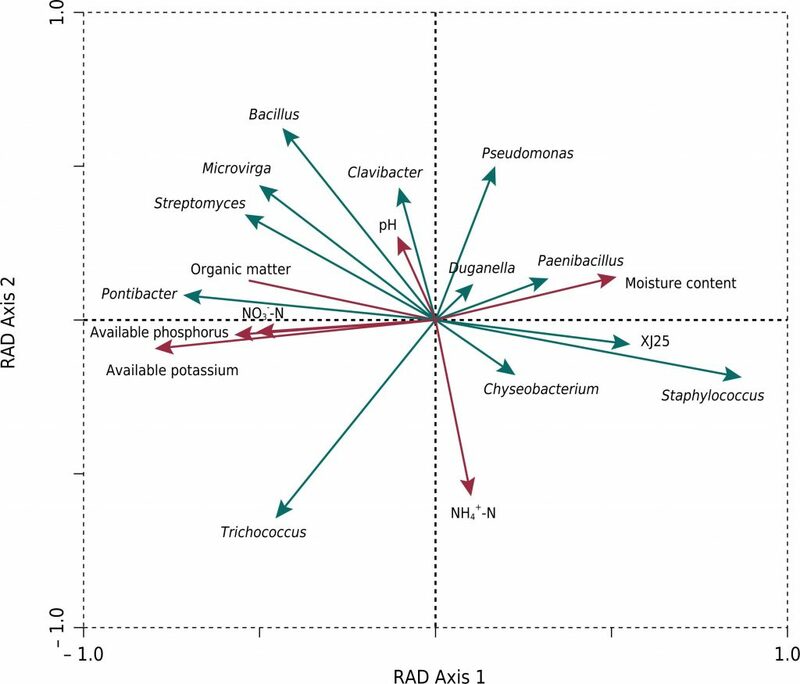 Redundancy discriminate analysis (RDA) plots of the relative abundance of bacterial genera and soil properties. Soil properties included available potassium, available phosphorus, moisture content, NO3- -N, organic matter, NH4+ -N, and pH (dashed arrows). Bacterial genera included Bacillus, Trichococcus, Paenibacillus, Microvirga, Pseudomonas, Duganella, Chryseobacterium, Pontibacter, Staphylococcus, Clavibacter, Streptomyces, and XJ25 (solid arrows, italics). Bacteria and soil properties were obtained from the 0.00-0.30 m soil layer. Eigenvalues (0.477 for horizontal axis, 0.201 for vertical axis) along the axes indicate the amount of variability explained in the relative abundance of bacterial genera.